SDAD Technology is a Leading website & Portal Development Company in India that offers Small Business Web Design, Website Template Design, Custom Web Templates and Redesigning, Flash Website Designing, Dynamic Web Development, and Total Website Custom Solution. Website templates are exclusively designed and developed by our Professional Web designers and developers. We normally sell our custom web templates for an attractive and low-cost proposition to people who require a website but do not have the skills to build them, such as the ability to code and provide total website custom solution. At SDAD Technology, our dedicated Template Design and Custom Web Templates that has the power to enhance your company's recognition in the web world and bring immense benefits too. However, we are also engaged in to provide web template redesigning service. 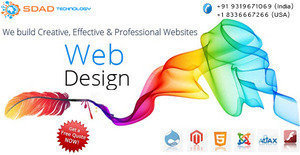 In web Template Designing Company in Delhi NCR and web templates redesigning we incorporate qualities of a good website design that include template design, content development, use of captions and Meta tags website navigation and broken links. Nowadays, web template designs and web templates redesigning are created might be misleading as many are commonly used by other websites too. Therefore our web designers make an added effort to design a website that is essentially genuine, lively, visually appealing with an attractive and suitable content that enhances your company’s image in the virtual world.